Hand In Hand: Happy St. Patrick's Day! 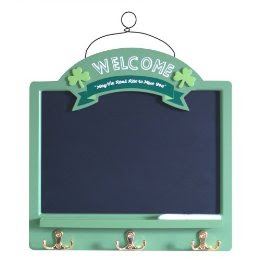 This cute little blackboard. We have been putting our keys on it. I wrote ,"Top O' The Mornin' To Ya! xoxo" on it and we haven't changed it since. It's actually kind of a hassle because we don't have a great place to hang it. And I actually hate blackboards. I don't know why whiteboards aren't used more often. WAY cleaner. The only thing I really like about the holiday is that so many people are wearing the same color and it's entertaining to me! Anyway! We are still waiting to hear back about the house! It's getting so frustrating just waiting, waiting, and more waiting. Every day I wake up thinking, "Maybe today we will find out we got the house!". But nope. Not yet! Michael thinks it will be next week. Or the next. Two months has never seemed so long! We are really looking forward to our Santa Barbara trip next month. I've been working on my tan! And it's getting so warm here- I love it! The brief moments I get to be outside are treasured. I had to walk to the bank today for work and it was so warm. It made me happy just being outside. Without a sweater! In fact it was a little hot. But I won't complain! And I love seeing all the cute sundresses and sandals the girls are wearing now. I can't wait to get that dress I bought in the mail! I still need to get some sandals to match. Well, have a great Wednesday and St. Patrick's Day! P.S- I got up again today at 4:30 am to go to the gym. I'm trying to make it a habit...but so far it's only been twice. Oh well, I'm proud of myself for going today! I looooooove Santa Barbara. Such a charming place! What the heck? You changed your blog address without even a warning!? I had no idea until you posted on my blog as "hand in hand" and I had to figure out who it was...it was then that I realized that it was you and the blog address I had in my reader wasn't connected to anything anymore. I'm glad I found you again! Have so much fun in SB! I love it there. It's really fun to go kayaking out of the harbor there. There's a buoy that the seals lie on that you can get pretty close to. It's one of my favorite things to do! Can't wait to hear about your trip!